on 31.10.2018 at 14:00 in room 02.112-128. 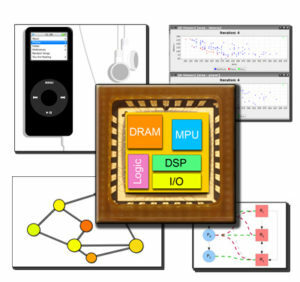 Embedded systems play an increasingly important role in everyday life. At the same time, the complexity of these systems continues to increase. With today’s technology, it is possible place millions, or in the near future, billions, of transistors on a chip. As a result, often the complete embedded system, a so-called system-on-a-chip (SoC), can be implemented on a single chip. Advantages including improved performance, lower energy consumption and lower costs can be achieved through the reuse of existing components. One of the challenges of existing SoCs is to establish correct and reliable communication between the components. For this reason, a network-like communication is provided to the components, whereby so-called networks-on-a-chip (NoCs) emerge. This seminar deals with the problems of design, synthesis and analysis of existing and future systems and networks on- a-chip. In particular, the compatibility of various requirements of the system such as costs, space and energy consumption, reliability, or security in the various phases of development should be considered. Topics: The topics will be presented and given during the preliminary discussion.